1 bundle of approx. 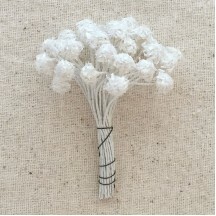 70 single-ended vintage flower stamen. 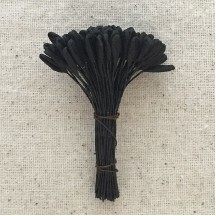 Stems are black, with black composition tips. 2-1/2"long overall with heads measuring 3/8" long x 1/8" wide. Old store stock; Made in Germany. 1 bundle of approx. 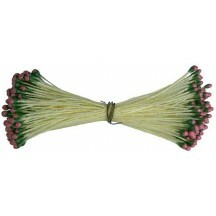 125 double-ended vintage flower stamen. 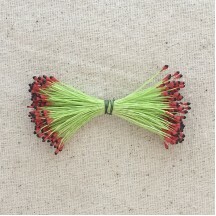 Stems are chartreuse green, with black and red tips. 2-1/2"long overall with tips measuring just over 1/16". Old store stock; Made in Germany. 1 bundle of approx. 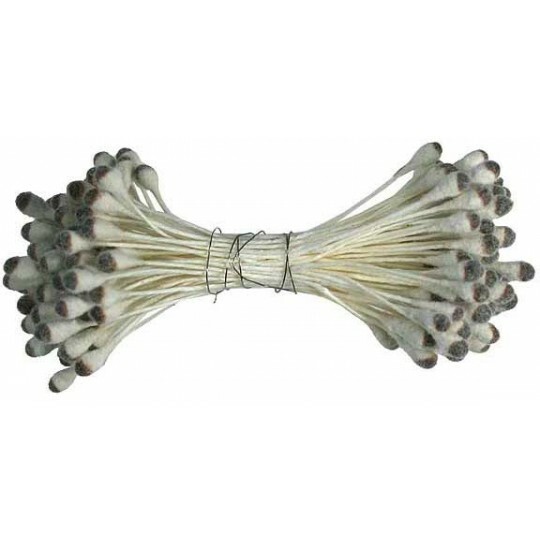 72 double-ended vintage flower stamen has 144 heads. 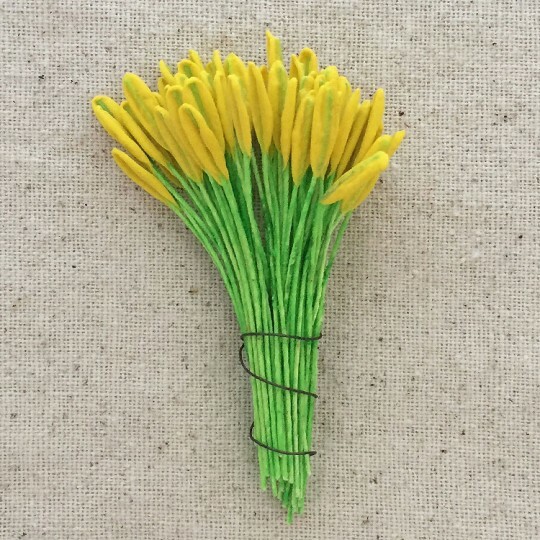 Stems are green, with yellow composition peps. 3 1/2"long overall with tips measuring just over 1/8". These are still bundled in their original wire. Old store stock; Made in Germany. 1 bundle of approx. 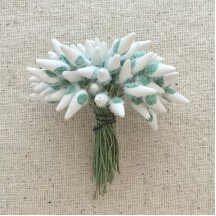 144 single-ended vintage flower stamen. 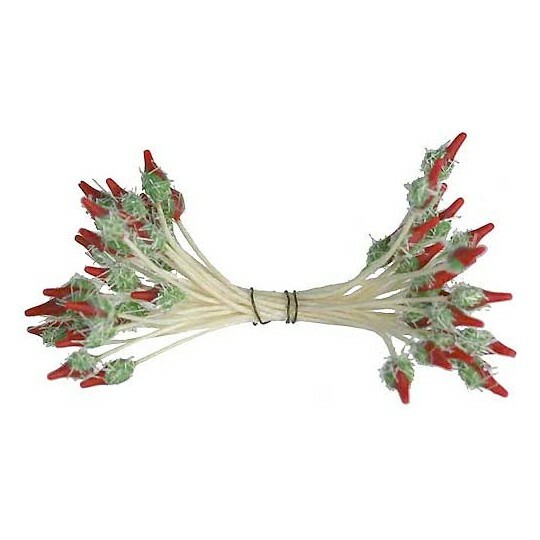 Stems are dark green sturdy wire; tips are pointed white with red. 3-1/2"long overall with heads measuring 3/8" long x 1/8" wide. Old store stock; Made in Germany. 1 bundle of approx. 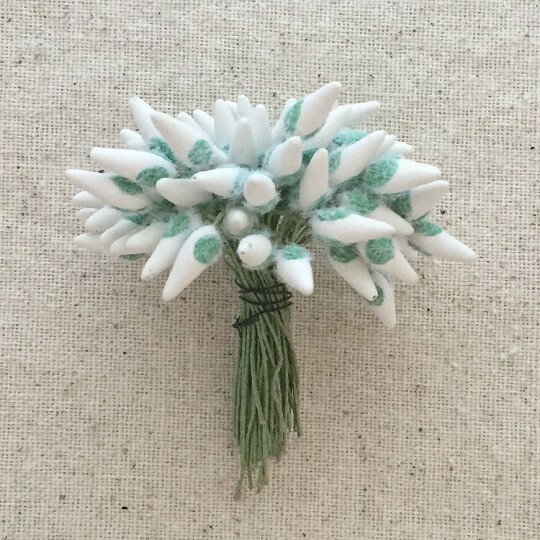 36 single-ended vintage nacre flower stamen. 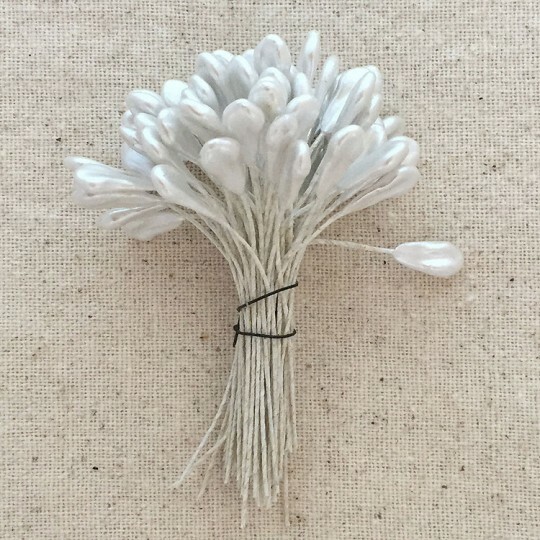 Stems are white sturdy wire; tips are flocked nacre pearl. 2-1/2"long overall with heads measuring 1/4". Old store stock; Made in Germany. 1 bundle of approx. 36 single-ended vintage flower stamen. 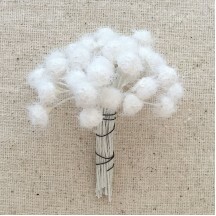 Stems are white sturdy wire; tips are fuzzy and soft white flocking. 2-1/2"long overall with heads measuring 3/8". Old store stock; Made in Germany. 1 bundle of approx. 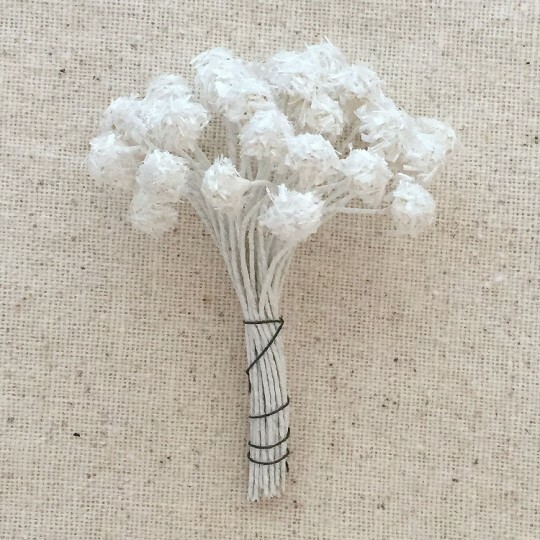 70 single-ended vintage flower stamen. 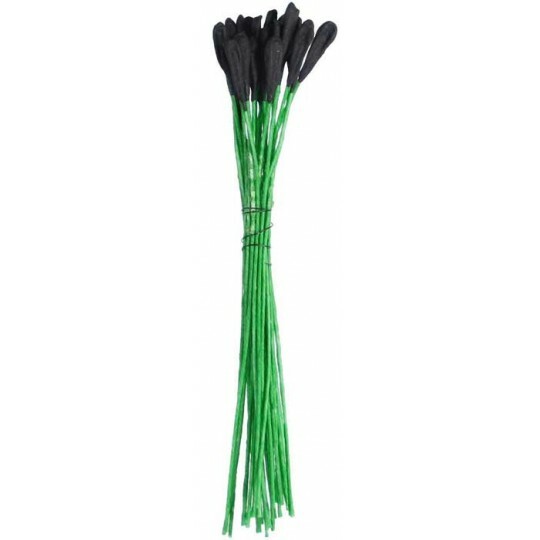 Stems are black, with green composition tips. 2-1/2"long overall with heads measuring 3/8" long x 1/8" wide. Old store stock; Made in Germany. 1 bundle of approx. 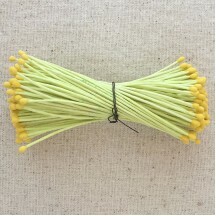 125 double-ended vintage flower stamen. 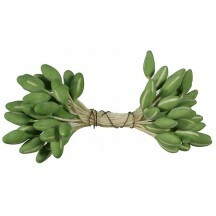 Stems are aqua green, with green and red tips. 2-1/2"long overall with tips measuring just over 1/16". Old store stock; Made in Germany. 1 bundle of approx. 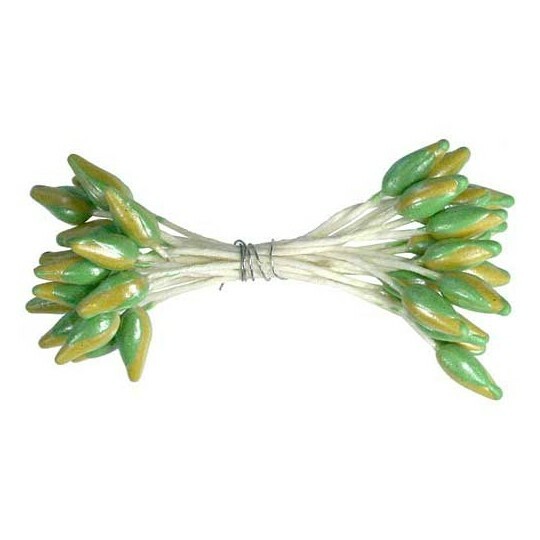 65 single-ended vintage nacre flower stamen. 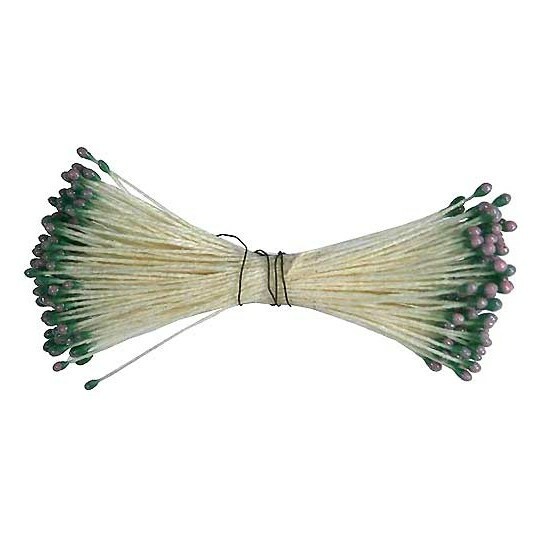 Stems are white sturdy wire; tips are paddle shaped pearl. 2-1/2"long overall with heads measuring 1/2" long x 3/8" wide. Old store stock; Made in Germany. 1 bundle of approx. 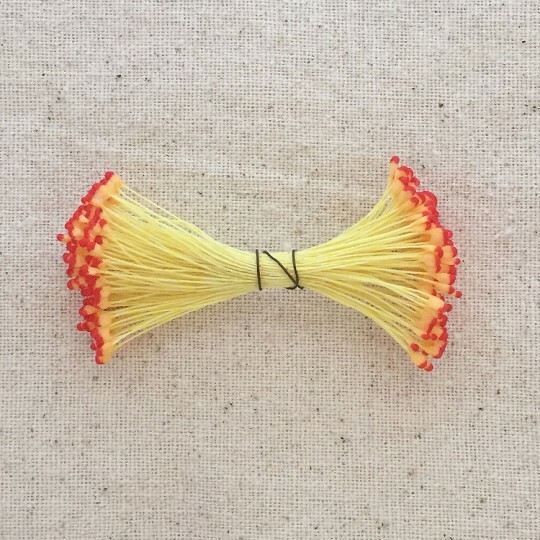 72 single-ended vintage flower stamen. Stems are green, with fuzzy round pink tips. 2-1/2"long overall with heads measuring 1/8". Old store stock; Made in Germany. 1 bundle of approx. 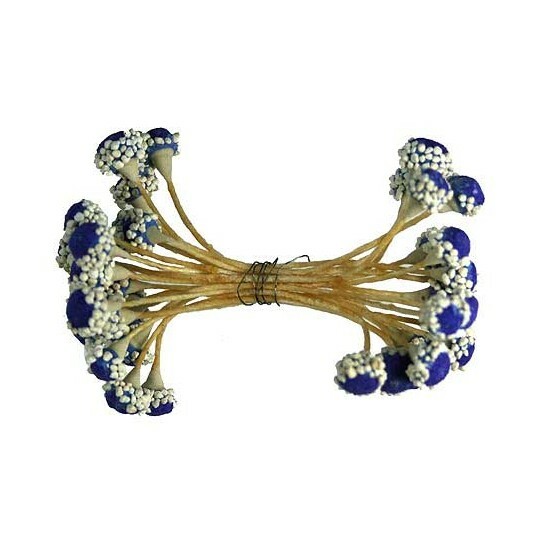 72 double-ended vintage flower stamen. 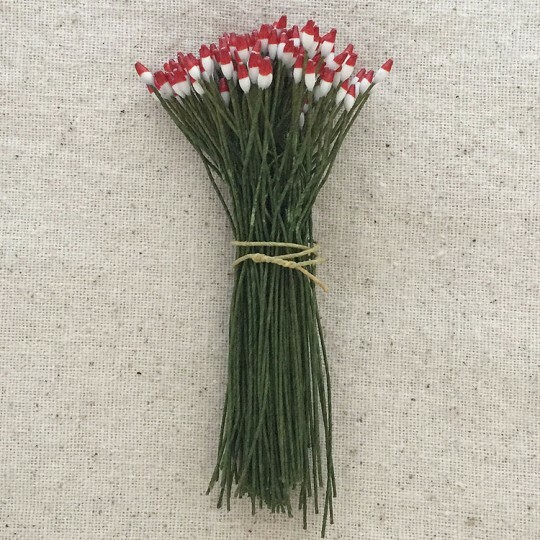 Stems are white, with fuzzy pointed sage and orange tips. 2-1/2"long overall with heads measuring 1/4" long x 1/8" wide. Old store stock; Made in Germany. 1 bundle of approx. 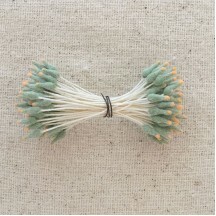 72 single-ended vintage flower stamen. 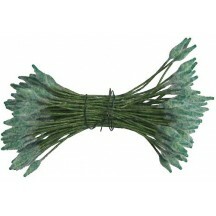 Stems are green; tips are pointed white with fuzzy sage green accents. 2-1/2"long overall with heads measuring 1/2" long x 3/8" wide. Old store stock; Made in Germany. 1 bundle of approx. 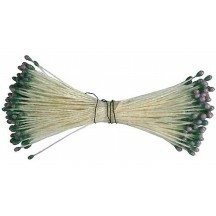 125 double-ended vintage flower stamen. Stems are yellow, with yellow and red flat-ish tips. 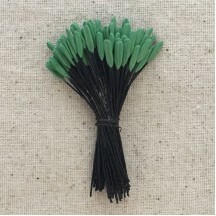 2-1/2"long overall with free-form tips measuring just over 1/16". Old store stock; Made in Germany. 1 bundle of approx. 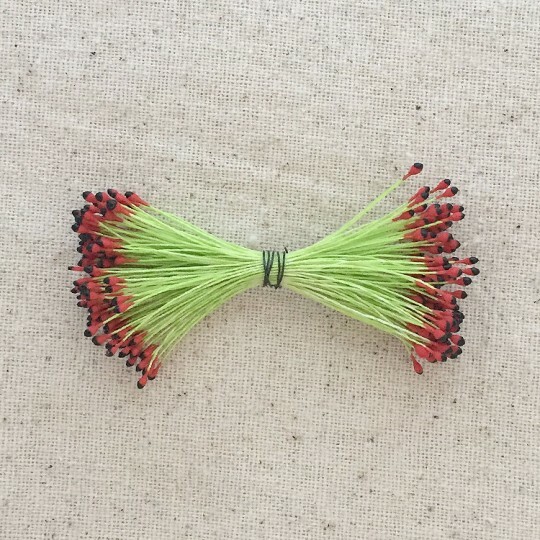 72 single-ended vintage flower stamen. 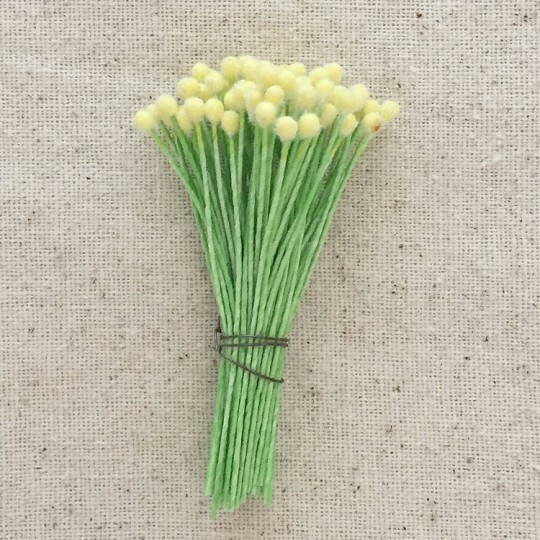 Stems are green, with fuzzy round yellow tips. 2-1/2"long overall with heads measuring 1/8". Old store stock; Made in Germany. 1 bundle of approx. 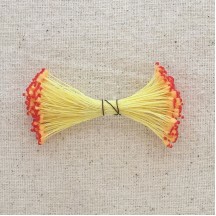 70 single-ended vintage flower stamen. 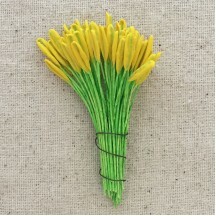 Stems are bright green, with yellow composition tips. 2-1/2"long overall with heads measuring 1/2" long x 3/8" wide. Old store stock; Made in Germany. 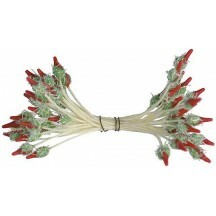 1 bundle of 18 double-ended vintage flower stamen has 36 heads. Stems are white, with bumpy mother of pearl tips. Tips are made with nacre, the same substance that coats the inside of pearly seashells. 2 1/2" long overall with tips measuring 1/4". These are still bundled in their original wire. Made in Germany in the 1950s. 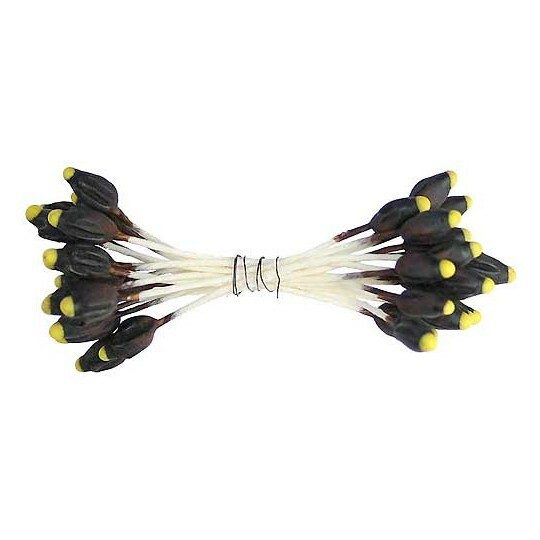 1 bundle of 18 double-ended vintage flower stamen has 36 heads. 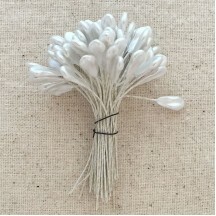 Stems are white, with mother of pearl tips. Tips are made with nacre, the same substance that coats the inside of pearly seashells. 2 1/2" long overall with flat-ish tips measuring 1/4". These are still bundled in their original wire. Made in Germany in the 1950s. 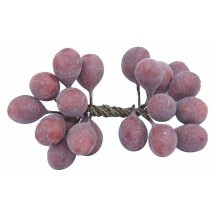 1 bundle of 10 double-ended berry stamen has 20 heads in dusted deep peach to create the look of real fuzzy peaches. Stems are wire wrapped with dark brown paper, tips are composition. 2 1/2" long overall with fruit tips measuring 1/2" long x 3/8" wide. Handmade in the Czech Republic. 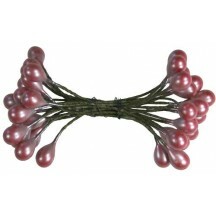 1 bundle of 18 double-ended berry stamen in glossy deep burgundy. Stems are wire wrapped with dark brown paper, heads are lacquered composition. 2 1/2" long overall with heads measuring just over 1/4". Handmade in the Czech Republic in the 1980s. 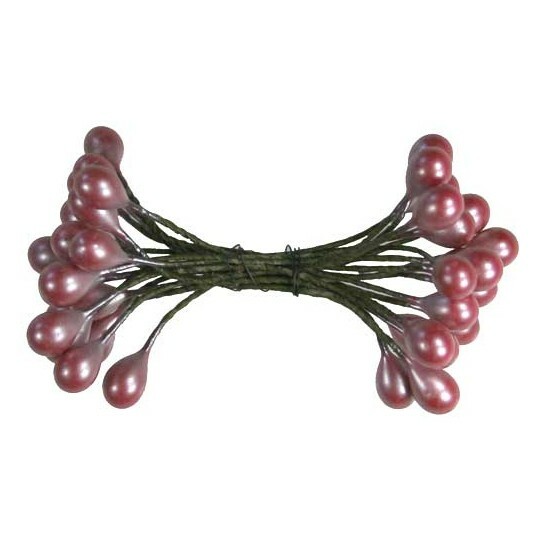 1 bundle of 18 double-ended berry stamen has 36 heads in glossy deepest eggplant purple. 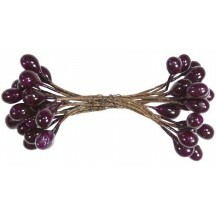 Stems are wire wrapped with dark brown paper, tips are lacquered composition. 2 1/2" long overall with tips measuring just over 1/4". Handmade in the Czech Republic in the 1980s. 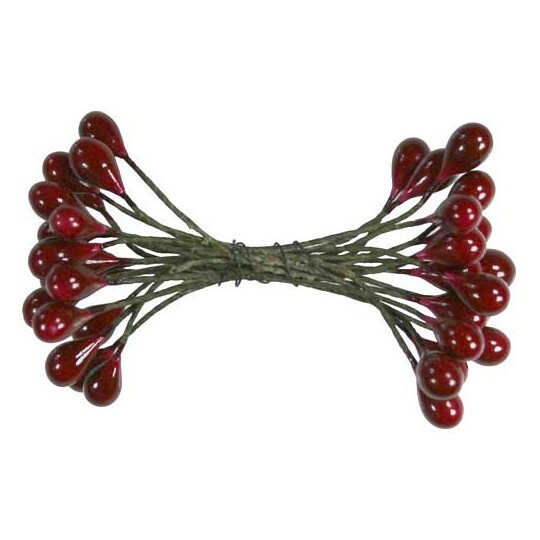 1 bundle of 18 double-ended berry stamen has 36 heads in glossy deep red. 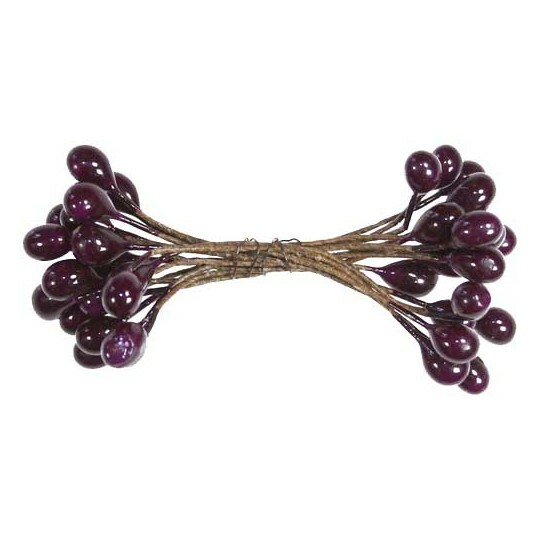 Stems are wire wrapped with dark brown paper, tips are lacquered composition. 2 1/2" long overall with tips measuring just over 1/4". Handmade in the Czech Republic in the 1980s. 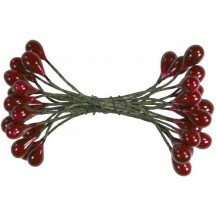 1 bundle of 36 double-ended berry stamen has 72 heads in glossy red. 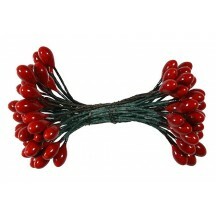 Stems are wire wrapped with dark brown paper, tips are lacquered composition. 2 1/2" long overall with tips measuring 3/8" long. Handmade in the Czech Republic. 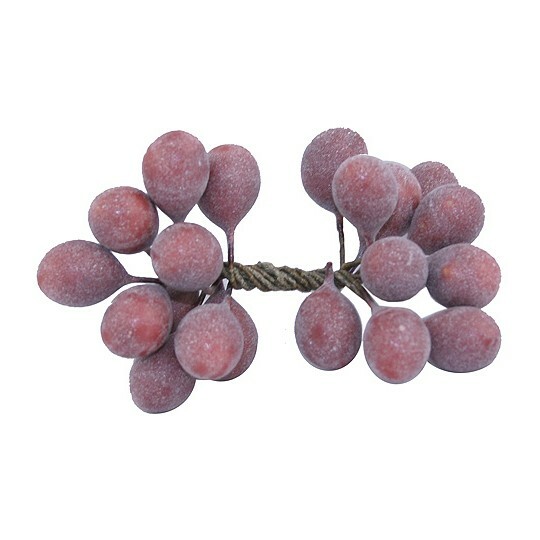 1 bundle of 18 double-ended berry stamen has 36 heads in pearescent pink. 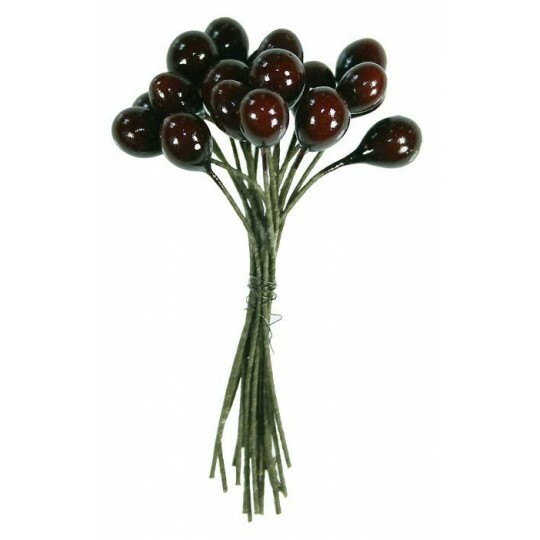 Stems are wire wrapped with dark brown paper, tips are lacquered composition. 2 1/2" long overall with tips measuring just over 1/4". Handmade in the Czech Republic in the 1980s. 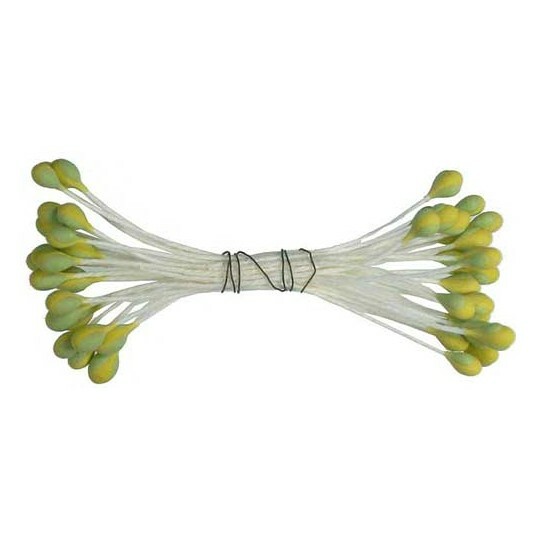 1 bundle of 18 double-ended vintage stamen has 36 heads. Stems are ivory, with blue heads and white pollen composition tips. 2 1/2" long overall with heads measuring 1/4" long and 1/4" wide. These are still bundled in their original wire. Made in Czechoslovakia in the 1980s. 1 bundle of 24 double-ended vintage stamen has 48 heads. Stems are ivory, with red heads and green with white pollen flocking. 2 1/2" long overall with heads measuring 1/4" long and 1/8" wide. These are still bundled in their original wire. Made in Czechoslovakia in the 1980s. 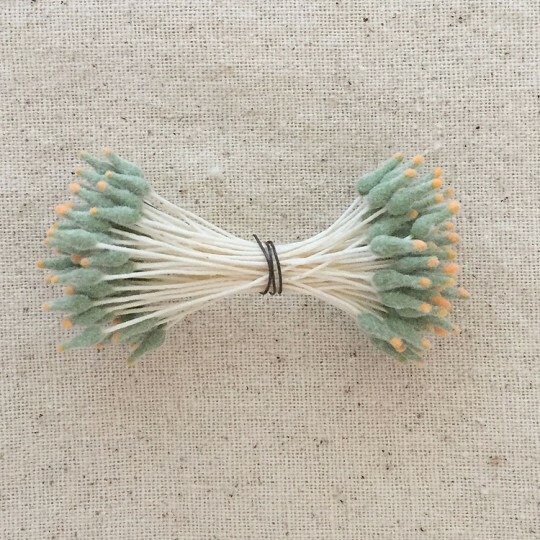 1 bundle of 72 double-ended vintage stamen has 144 heads. 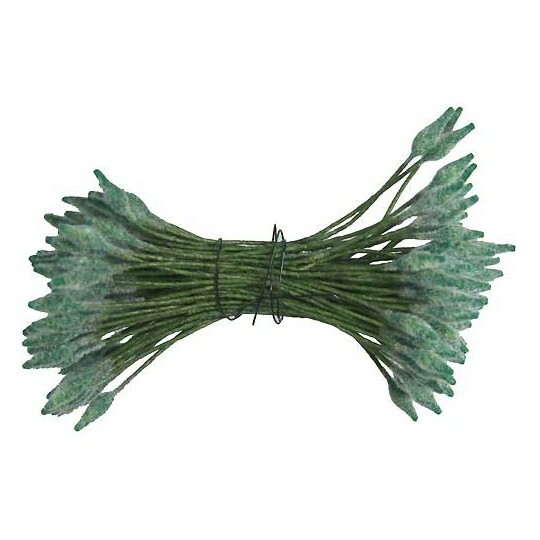 Stems are green, with fuzzy green flocked heads. 2 1/2" long overall with heads measuring 1/4" long and 1/8" wide. These are still bundled in their original wire. Made in Czechoslovakia in the 1980s. 1 bundle of 72 double-ended vintage stamen has 144 heads. 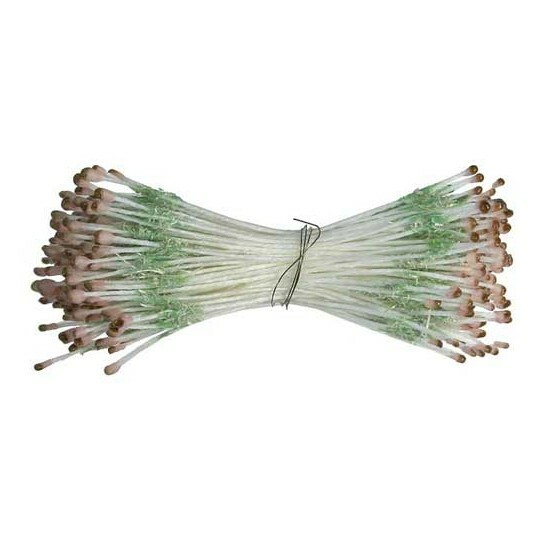 Stems are white, with pink heads and glossy brown tips. Stems have green with with flocking. 2 1/2" long overall with heads measuring 1/16" long and 1/16" wide. These are still bundled in their original wire. Made in Czechoslovakia in the 1980s. 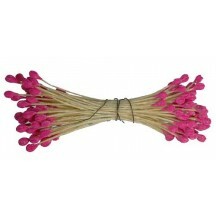 1 bundle of 72 double-ended vintage stamen has 144 heads. Stems are white, with yellow heads and glossy brown tips. 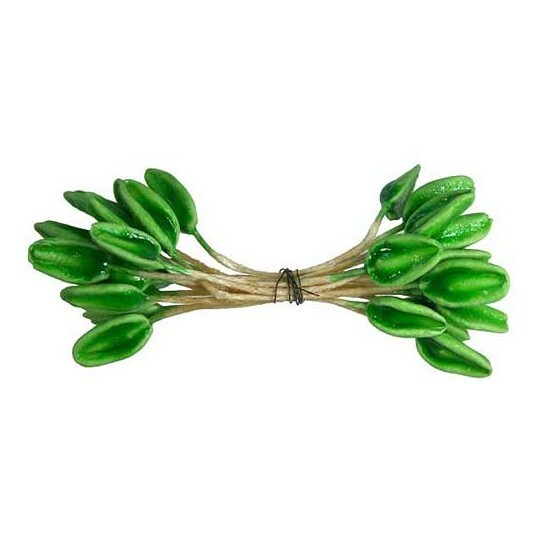 Stems have green with with flocking. 2 1/2" long overall with heads measuring 1/16" long and 1/16" wide. These are still bundled in their original wire. Made in Czechoslovakia in the 1980s. 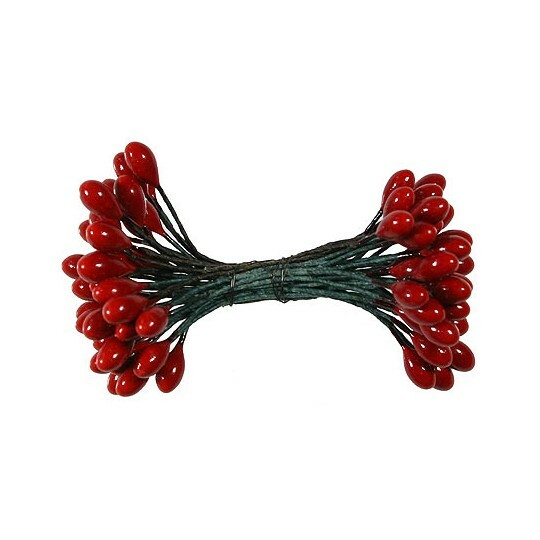 1 bundle of 72 double-ended vintage stamen has 144 heads. 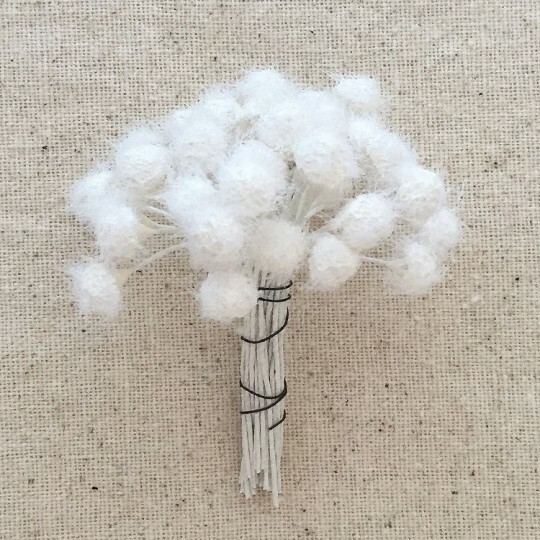 Stems are ivory, with fuzzy white flocked heads with brown tips. 2 1/2" long overall with heads measuring 1/4" long and 1/8" wide. These are still bundled in their original wire. Made in Czechoslovakia in the 1980s. 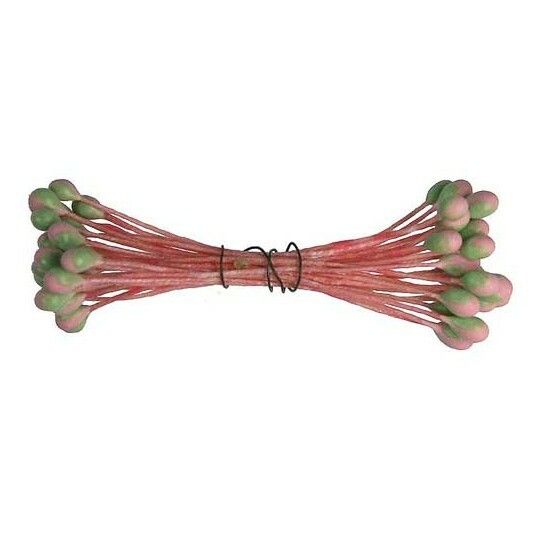 1 bundle of 15 double-ended vintage stamen has 30 heads. 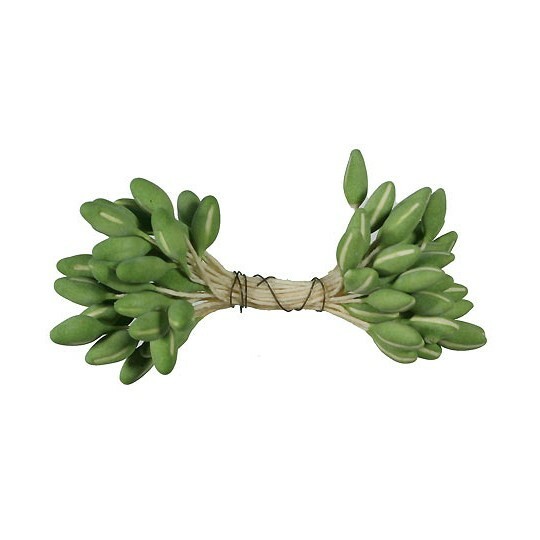 Stems are ivory, with green paddle shaped heads. 2 1/2" long overall with heads measuring 1/2" long and just under 1/4" wide. These are still bundled in their original wire. Made in Czechoslovakia in the 1980s. 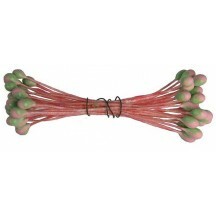 1 bundle of 18 double-ended vintage stamen has 36 heads. 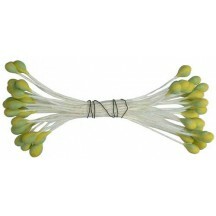 Stems are ivory, with pearlescent light yellow and green shaped heads. 2 1/2" long overall with heads measuring 3/8" long and just over 1/8" wide. These are still bundled in their original wire. Made in Czechoslovakia in the 1980s. 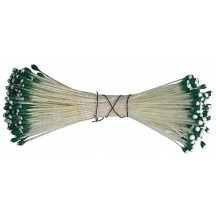 1 bundle of 24 double-ended vintage stamen has 48 heads. Stems are ivory, with yellow composition heads with red accents. 2 1/2" long overall with heads measuring 1/4" long and just over 1/4" wide. These are still bundled in their original wire. Made in Czechoslovakia in the 1980s. 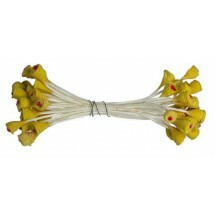 1 bundle of 18 double-ended vintage stamen has 36 heads. 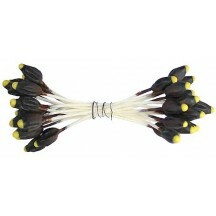 Stems are ivory, with brown and yellow shaped composition tips. 2 1/2" long overall with tips measuring 3/8" long and 1/8" wide. These are still bundled in their original wire. Made in Czechoslovakia in the 1980s. 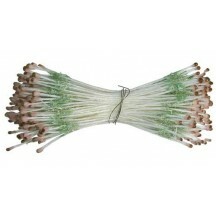 1 bundle of 24 long vintage stamen. 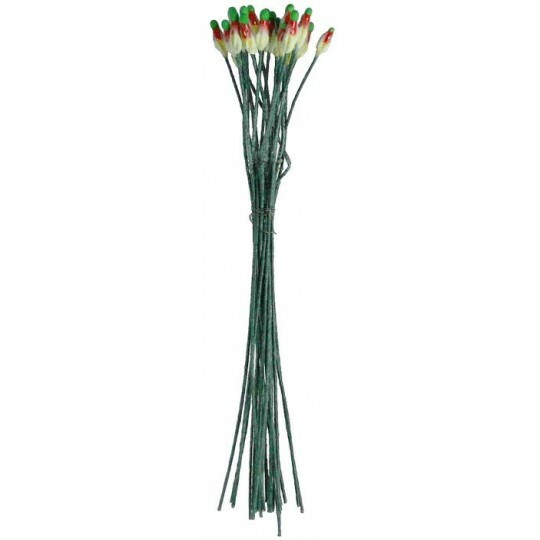 Stems are green, with shaped composition tips in green, red and yellow. 4-3/4" long overall with tips measuring 3/8" long and 1/8" wide. These are still bundled in their original wire. Made in Czechoslovakia in the 1980s. 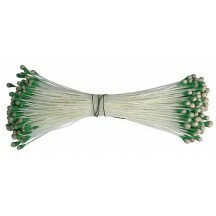 1 bundle of 36 double-ended vintage stamen has 72 heads. 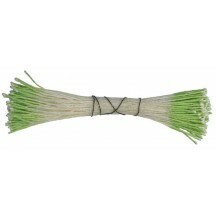 Stems are ivory, with moss green shaped composition tips with ivory stripes. 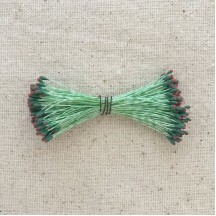 2 1/2" long overall with tips measuring 3/8" long and 1/8" wide. Made in the Czech Republic. 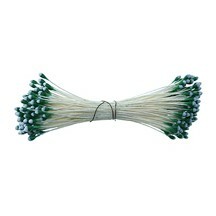 1 bundle of 24 double-ended vintage stamen has 48 heads. 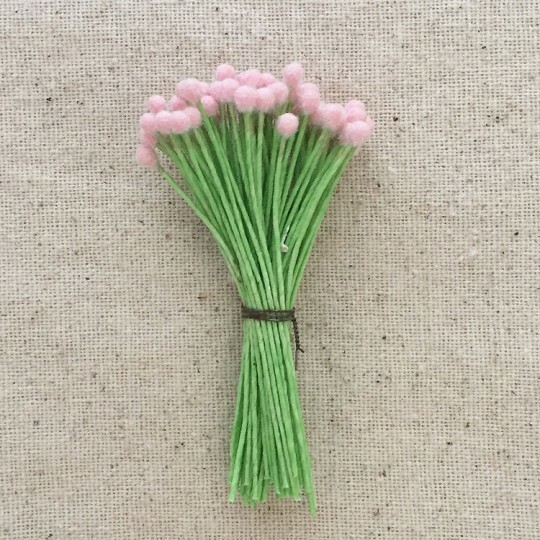 Stems are pink, with light green and pink shaped composition tips. 2 1/2" long overall with tips measuring just under 1/4" long and 1/8" wide. These are still bundled in their original wire. Made in Czechoslovakia in the 1980s. 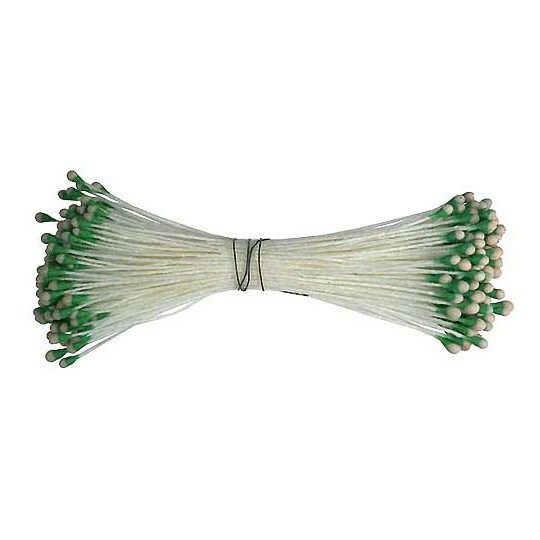 1 bundle of 24 double-ended vintage stamen has 48 heads. 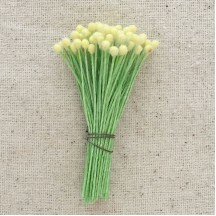 Stems are ivory, with light green and yellow shaped composition tips. 2 1/2" long overall with tips measuring just under 1/4" long and 1/8" wide. These are still bundled in their original wire. Made in Czechoslovakia in the 1980s. 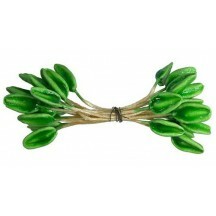 1 bundle of 24 long vintage lily stamen. 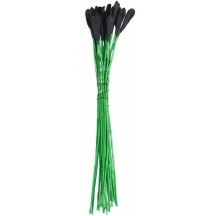 Stems are green, with shaped composition tips black. 4" long overall with tips measuring 1/2" long and 1/8" wide. These are still bundled in their original wire. Made in Czechoslovakia in the 1980s. 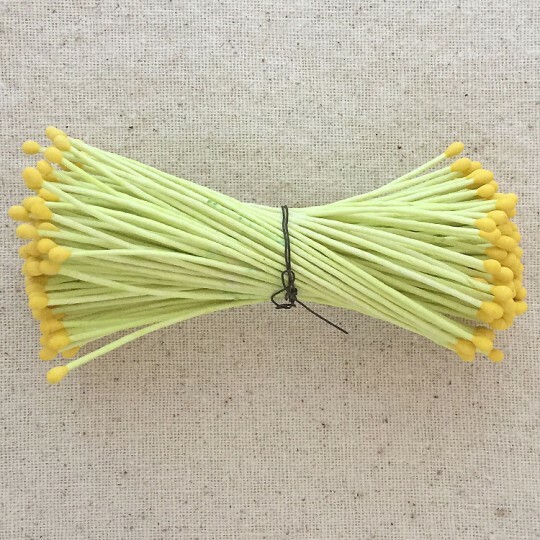 1 bundle of 24 long vintage stamen. 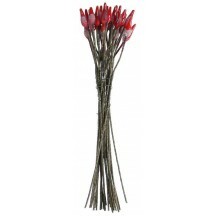 Stems are brown, with two tone red shaped composition tips. 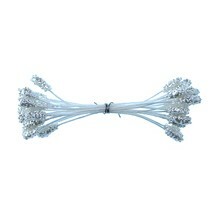 3-5/8" long overall with tips measuring 3/8" long and 1/8" wide. These are still bundled in their original wire. Made in Czechoslovakia in the 1980s. 1 bundle of approx. 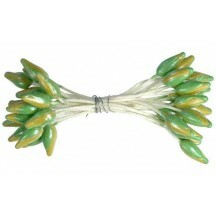 72 double-ended vintage flower stamen has 144 heads. 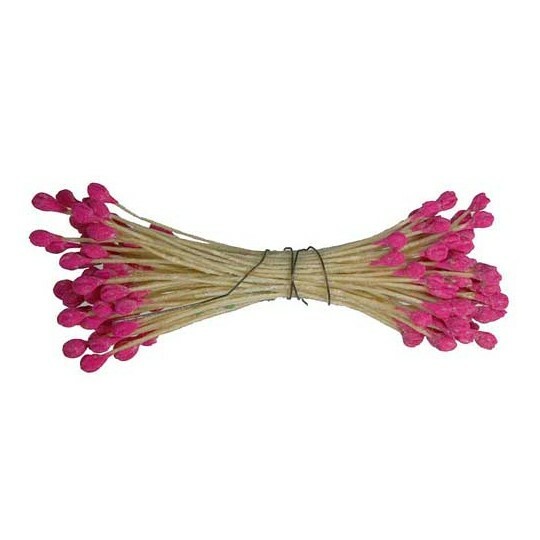 Stems are tan, with deep pink shaped tips. 2 1/2" long overall with tips measuring just over 1/8" long and 1/8" wide. These are still bundled in their original wire. Made in Czechoslovakia in the 1980s. 1 bundle of approx. 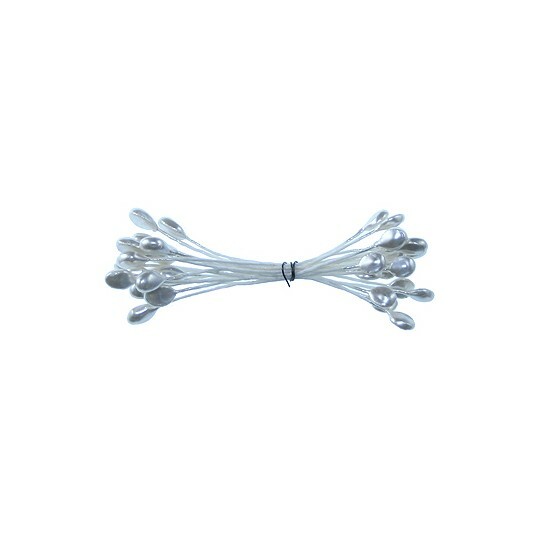 144 double-ended vintage flower stamen has 288 heads. 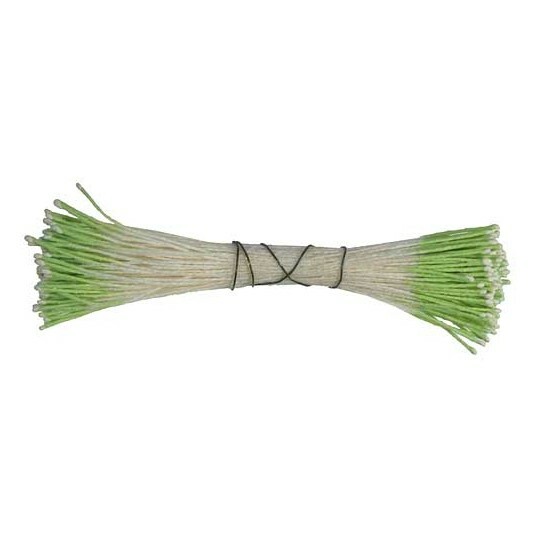 Stems are white, with long green ends with white tips. 2 1/2" long overall with tips measuring just over 1/32". These are still bundled in their original wire. Made in Czechoslovakia in the 1980s. 1 bundle of approx. 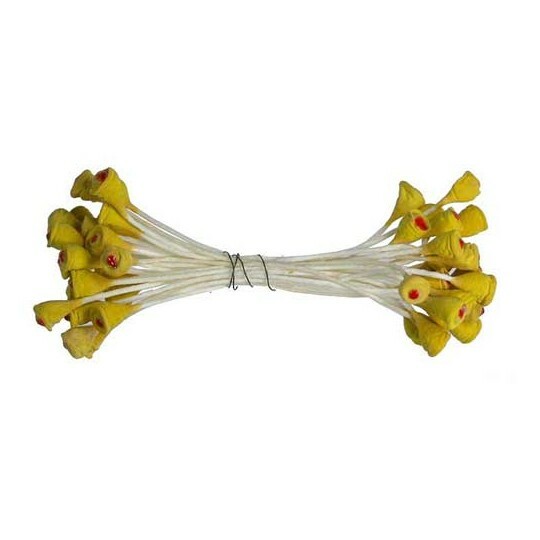 72 double-ended vintage flower stamen has 144 heads. 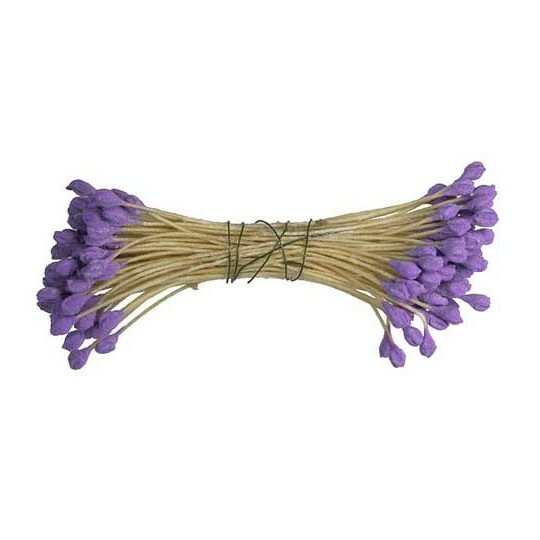 Stems are tan, with purple shaped tips. 2 1/2" long overall with tips measuring just over 1/8" long and 1/8" wide. These are still bundled in their original wire. Made in Czechoslovakia in the 1980s. 1 bundle of approx. 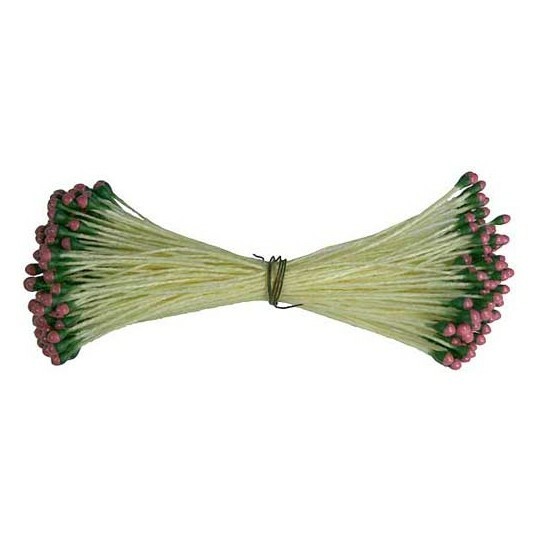 144 double-ended vintage flower stamen has 288 heads. 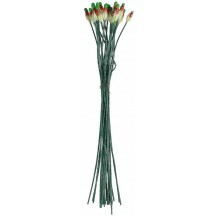 Stems are white, with green ends and pale pink tips. 2 1/2" long overall with tips measuring just over 1/16". These are still bundled in their original wire. Made in Czechoslovakia in the 1980s. 1 bundle of approx. 144 double-ended vintage flower stamen has 288 heads. 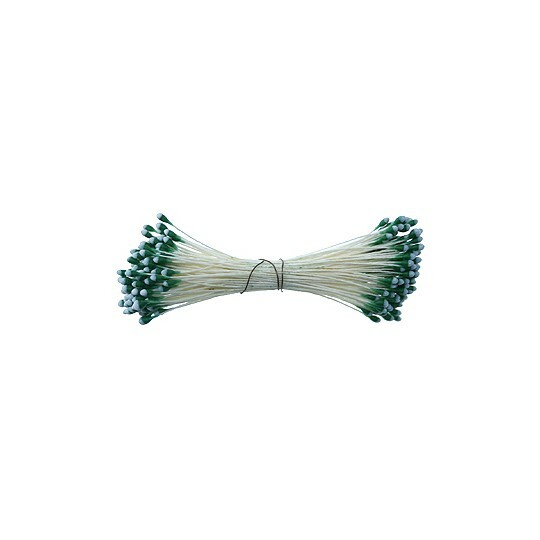 Stems are white, with green ends and bright white tips. 2 1/2" long overall with tips measuring just over 1/16". These are still bundled in their original wire. Made in Czechoslovakia in the 1980s. 1 bundle of approx. 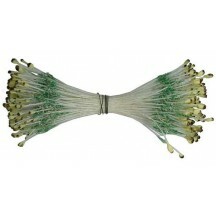 144 double-ended vintage flower stamen has 288 heads. 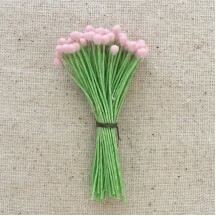 Stems are light yellow, with green ends and glossy hot dusty pink tips. 2 1/2" long overall with tips measuring just over 1/16". These are still bundled in their original wire. Made in Czechoslovakia in the 1980s. 1 bundle of approx. 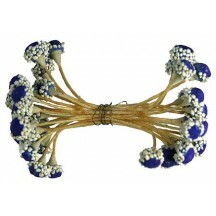 144 double-ended vintage flower stamen has 288 heads. 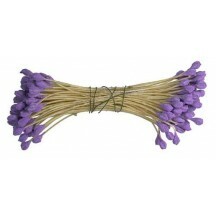 Stems are ivory, with green ends and glossy pale purple tips. 2 1/2" long overall with tips measuring just over 1/16". These are still bundled in their original wire. Made in Czechoslovakia in the 1980s. 1 bundle of approx. 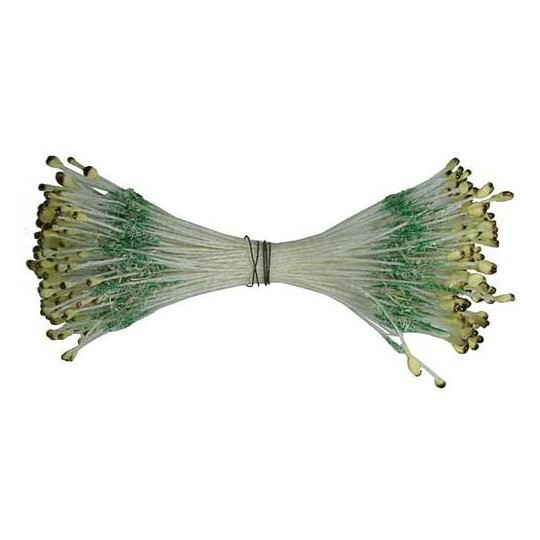 144 double-ended vintage flower stamen has 288 heads. 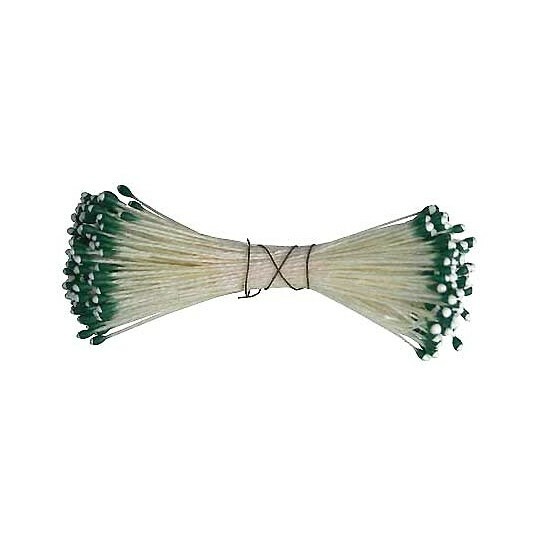 Stems are white, with Kelly green composition ends with white tips. 2 1/2"long overall with tips measuring just under 1/8". These are still bundled in their original wire. Made in Germany in the 1950s.